Bill Mainland - Heritage Funeral Homes Inc.
Of Arthur passed away peacefully at the Louise Marshall Hospital, Mount Forest on Saturday, September 29, 2018 in his 73rd year. Beloved husband of Marnie (Griffith) Mainland for 46 years. Dear father of Ryan Mainland and Jackie Coyes of Alberta, Randal and Kaley Mainland of Orangeville and Megan and Christopher Scott of Elora. Grandfather of Thayne and Brady; Briar-Rose, Carter, and Bennett; Emily and Xavier. Brother of Evelyn and Reg Horney, Alice and Jim Kerr and Robert and Dorothy Mainland. Brother-in-law of Veva Spark, Lenora Arbuckle, Glenna and Doug Smith and Wilma Wollis. Fondly remembered by his nieces, nephews and friends. The family will receive friends at the Crawford Funeral Chapel, 243 George Street, Arthur on Tuesday, October 2, 2018 from 2 to 4 and 7 to 9 p.m. The Funeral Service will be held in the Arthur United Church on Wednesday, October 3, 2018 at 11:00 a.m. followed by cremation. 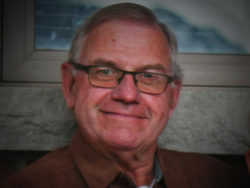 As expressions of sympathy donations to the Heart and Stroke Foundation, Arthur United Church or the Charity of your choice would be appreciated by the family. Prince Arthur Lodge # 334 will conduct a Masonic Service in the Funeral Home on Tuesday evening at 6:30 p.m.